We’d love your help. Let us know what’s wrong with this preview of Bloodline of the Gods by Nick Redfern. These are controversial and thought-provoking questions. They are a Are significant numbers of humanity the product of an ancient and advanced alien civilization? Have we, across the millennia, been periodically modified and refined as a species? In short, has our genetic make-up been manipulated by otherworldly beings that view human civilization as one big lab experiment? The vast majority of humankind--85 to 90 percent--is Rh positive, which means a person's red blood cells contain an antigen directly connected to the Rhesus monkey. This antigen is known as the Rh factor. Each and every primate on the planet has this antigen, except for one: the remaining 10 to 15 percent of humans. If the theory of evolution is valid--that each and every one of us is descended from ancient primates--shouldn't we all be Rh positive? Yes, we should. But we're not. The Negatives are unlike the rest of us. They are different. To ask other readers questions about Bloodline of the Gods, please sign up. I really wanted to give it four stars. Really. It was stylistically a very easy read. The use of many different fields in order to prove his hypothesis was well done, able to connect some science to legends, for example, and strongly suggest these are more than coincidences. I especially liked the blood restrictions of the Bible, and the legends of "fairies" and similar magical organisms. The alien abductees almost always reporting reproductive and sexual encounters, and being Rh-, also create a I really wanted to give it four stars. Really. It was stylistically a very easy read. The use of many different fields in order to prove his hypothesis was well done, able to connect some science to legends, for example, and strongly suggest these are more than coincidences. I especially liked the blood restrictions of the Bible, and the legends of "fairies" and similar magical organisms. The alien abductees almost always reporting reproductive and sexual encounters, and being Rh-, also create a strong argument. Then he goes through (mostly anecdotal) evidence that the types of genetic manipulations for the Rh negatives may still be going on. (The Black Eyed Children, as they did before, scared me.) So yes, it is a very well structured, well researched, well written text. However, some of the biology is not as well thought out; some of that also is not the author's fault, as one set of evidence for example, like letters passing in the mail, was published as this book was in press. More research came out recently after the book was published. It would be interesting to see if the author would change his hypothesis any with the new evidence and other points below. The overall hypothesis is that there was an alien intervention in Homo evolution forming Rh- people. One reason for this the author states as a question: why would a Rh- mother have the ability to kill her own Rh+ child? The author assumes in this case all genetic changes are always good. But look at something like malaria and sickle cell, where being sickle cell is just as bad as getting malaria. Also just recently published was a study that showed a mother's immune response could contribute to a child's autism. Therefore yes, a mother may fight her fetus, on more than one gene. So the assumption that a mother would never try to kill or harm her fetus is false and weakens the argument. Second, the one "crossed in the mail" was the claim that there are no Neanderthal genes in modern humans. That has been revised with further study to at least 4% of modern DNA is Neanderthal derived. Third, the author does not sufficiently debunk a more standard hypothesis for the appearance and localization of Rh- peoples, namely, random mutation, migration, and genetic drift in those isolated populations. But there is enough here to warrant further study. Maybe by sequence analysis we can find or not the mutations and drift. We can see if the Rh- Cro-Magnon man and their Basque, Celtic and other descendants do or do not have Neanderthal DNA. We can see if the other traits Rh- have such as the extra L vertebrae, lower blood pressure extra rib, etc, are linked, or in the author's terms, are in the same engineered area. Conclusion: I do not think the author is wrong. There are too many coincidences from all the fields for something not to be there. But there is work to be done, especially in the biology, to call it a "theory." It is a plausible hypothesis in need of some more research. Anyone want to fund me to do the sequence part? Many great books are written when an author has an inspiration and becomes totally enthusiastic about the subject. Unfortunately, this book was admittedly written as an assignment, and a request from Redfern's Publisher. As such, it lack passion and is a patchwork of various sources mixed together. Rather than independent research, this is a re-hatch of several existing books about UFO's (Budd Hopkins, Whitley Strieber, etc. ), and alien ancestors (notably Zechariah Sitchen and Erich Von Dnaiken) Many great books are written when an author has an inspiration and becomes totally enthusiastic about the subject. Unfortunately, this book was admittedly written as an assignment, and a request from Redfern's Publisher. As such, it lack passion and is a patchwork of various sources mixed together. Rather than independent research, this is a re-hatch of several existing books about UFO's (Budd Hopkins, Whitley Strieber, etc. ), and alien ancestors (notably Zechariah Sitchen and Erich Von Dnaiken). If you have already read these books, this is quite boring and repetitious. There is some information about blood research, but it is mostly standard and encompasses a small part of the book. it is almost as if Redfern needed to fill the book with a certain number of pages, so he boringly includes summaries of several well-known books on UFO's over many pages, as a filler. When he started talking about alien, lizard, shape-shifters amongst us, as though they were common knowledge and factual, and that the Queen of England was one, I almost tossed the book in the garbage. Even many believers in the possibility of UFO's and alien ancestors know where to draw the line. The argument about "most" RH-negative people having very similar physical characteristics is total nonsense. One may inherit the blood type of a parent, but other physical traits are separate and have nothing to do with the gene for blood type. It is true that the RH-Negative blood type is unusual, and may have been inherited from certain ancestral groups many tens or hundreds of thousands of years ago. However, today, it is only one of thousands of physical characteristics that we inherited from our ancestors. Redfern's point about the mystery of the Basque people as a group, predominantly having RH-Negative blood, is not mysterious at all. They lived in a very remote mountain area, were keen to preserve the traditions of their own unique culture, and like all such closely-bound groups, there was likely much in-breeding taking place in this very close family-like community. Therefore prevalence of the blood type and certain physical characteristics is nothing outstanding, but expected. Redfern makes far too much of this blood type. I have RH-Negative blood, and know others that also have it, but we lack many of the so-called "common" characteristics that Redfern likes to pretend exists. Of course, coincidentally, there are some commonalities that I can relate to (e.g. my obsessive interest in unusual phenomena such as UFOs, alien ancestors, history, Egyptology, etc. ), but you will find commonalities and differences amongst most groups of people that have nothing to do with blood types. For example, my half-sister, who is also RH-Negative, has absolutely no interest in UFO's, alien ancestors, or any other New Age interest at all, has never had "psyschic" experiences of any kind, etc. On the other hand, my brother, who enthusiastically shares all my interests and physical characteristics (we look and act very similar), has a Positive blood type, and even his blood is from a different Group than mine. Nick Redfern, who has been seen on the series "Ancient Aliens", is a good writer. The topic is finally taken up that I've always wondered about. If we all have the same origen, why should our blood types be different? Even causing a natural reaction in a mother to attack her fetus of a different Rh type? The only issue I have is that Redfern soliloquizes over religious beliefs causing terroristic actions and then goes on to say that if people thought their bloodline was caused by alien genetic tinkering that (1) their belief in God would be abolished (why couldn't people just extrapolate that their God is even bigger than previously thought and created the alien race, too? ), and; (2) without religion, which he says is responsible for the ardent terrorism, that there will be no social order but chaos (if religion causes terrorism and strife, one would think it a boon to social order and elimination of "my God vs your God"-caused terrorism). Redfern needs to spend less time on the soapbox about his feelings in this area and make a stronger connection about the possible reactions. It's mainly a load of hooey, but a fun read. 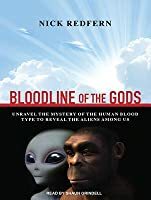 Nick Redfern is an engaging writer-- he has the gift of writing with the same "voice" he uses in TV conversation, and he gets to use more humor in his own book than he does when he appears on Ancient Aliens. However. He does a lot of very blatant leading the reader to agree with his conclusions by ignoring other possibilities, and he doesn't hide it very well. His scientific and medical statements are suspect, to say the least. But it's a good survey o It's mainly a load of hooey, but a fun read. I gave this book 5 stars because it was clear had some very good historical data that i wasnt aware of. I mean... if you are familiar with his work you'll probably like this. The most important part is in the introduction where you find out how to have your blood tested for alien DNA, the rest is sort of a rehashing of the Bible's greatest hits through the eyes of ancient astronaut theory. An indulgence into the imagination of possibilities... life would be ever so boring if we couldn't make chaotic poetry of it. Truth is time and we know very little of its pulsebeat dreaming. I put the book down about half-way through. 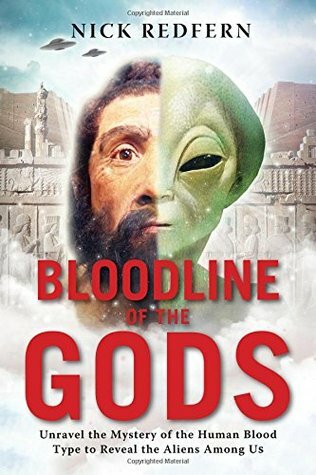 It's not bad, and may be very interesting to people unfamiliar with some of the Sitchin/Ancient Astronaut info...but I found there were too many pages rehashing a somewhat questionable premise (and I say that as someone who has read all of Sitchin's books and still am very dubious about his overall assertions). Nick Redfern is a really good writer, but this book felt like a subject that Nick was assigned. I'd recommend it to someone who is new to ancie I put the book down about half-way through. It's not bad, and may be very interesting to people unfamiliar with some of the Sitchin/Ancient Astronaut info...but I found there were too many pages rehashing a somewhat questionable premise (and I say that as someone who has read all of Sitchin's books and still am very dubious about his overall assertions). Nick Redfern is a really good writer, but this book felt like a subject that Nick was assigned. I'd recommend it to someone who is new to ancient aliens concepts. I'd recommend others who have read a lot on the subject to get the Rh info from audio's on the subject that can be found on Youtube. Nick Redfern is a British best-selling author, Ufologist and Cryptozoologist who has been an active advocate of official disclosure, and has worked to uncover thousands of pages of previously-classified Royal Air Force, Air Ministry and Ministry of Defence files on UFOs dating from the Second World War from the Public Record Office. He has has appeared on a variety of television programmes in the Nick Redfern is a British best-selling author, Ufologist and Cryptozoologist who has been an active advocate of official disclosure, and has worked to uncover thousands of pages of previously-classified Royal Air Force, Air Ministry and Ministry of Defence files on UFOs dating from the Second World War from the Public Record Office. He has has appeared on a variety of television programmes in the UK and works on the lecture circuit, both in the UK and overseas, and has appeared in internationally syndicated shows discussing the UFO phenomenon. He is also a regular on the History Channel programs Monster Quest and UFO Hunters as well as National Geographic Channels's Paranormal and the SyFY channel's Proof Positive. Redfern now lives in Texas and is currently working as a full-time author and journalist specializing in a wide range of unsolved mysteries, including Bigfoot, the Loch Ness Monster, UFO sightings, government conspiracies, alien abductions and paranormal phenomena, and also works as a feature writer and contributing editor for Phenomena magazine and writes regularly for other magazines and websites.